Nestled in the heart of the Portuguese city, UNESCO site, the Dar Yasmina is a gem tastefully restored in the finest style of Moroccan craftsmanship. Bejmat, zelliges, arabesques multiple, moucharabias, doors, windows and cedar wood paneling, games fairy lights, no detail has been overlooked to make it a worthy of those Riad in Marrakech. -A Central patio in white and blue zellige 4 wooded vaults of palm trees and a garden. In the background a beautiful fountain decorated with 2 doors opening on moucharabia closet and a second staircase concealing the. - On a first chamber opening by two beautiful stained glass in large windows and decorated with antique wrought iron onto the patio. In large wooden cross carved cedar closet. It is furnished with a large 160 bed, night tables hand-painted by artisans in Marrakesh, old mirror, small table mat cedar root. At night ajar window be surrounded in these rooms by the sound of the ocean. -A Bathroom with large double sinks and zelliges of Fez. It also has a large Moroccan shower (with benches) hammam style. - A separate toilet with sanitary and copper sink. On a large terrace of 62 m² decorated with olive, mimosa, citrus, of potted shrubs, cacti and other exotic plants not to mention beautiful bougainvillea. It also has a small fountain water reserve for birds. This large terrace has been designed to minimize any opposite. In the bottom of the terrace, 1 beautiful room decorated style pergola moucharabias with 2 beds in 90 with rubber and forming seat cushions. This piece is completely closed with a clever system of doors moucharabias, which obscured curtains form a real extra room. On the side laundry area and summer kitchen, featuring a washing machine, a small refrigerator and a gas stove. Beautiful ceramic sink and cupboards also decorated. Upper terrace of 11m with a stunning 360 ° view of the ocean, the terraces of the Portuguese city, the port, and over all the beach of El Jadida. The Riad is very pretty. It was quiet at night and mostly during the day. The parking is around the Church inside the wall. We parked outside because we didn't know you could drive in. We are looking for a place to relax and it was perfect. The bottom floor has one toilet and one shower, the next floor has two bedrooms and a shower room and a toilet room. The top floor it the roof and it has one open air room. The bed we used was comfortable. The wifi is good on the floor with the bedrooms. The only complaint is the water pressure and the sprayers in the showers. But they worked. I would be happy to stay here again. 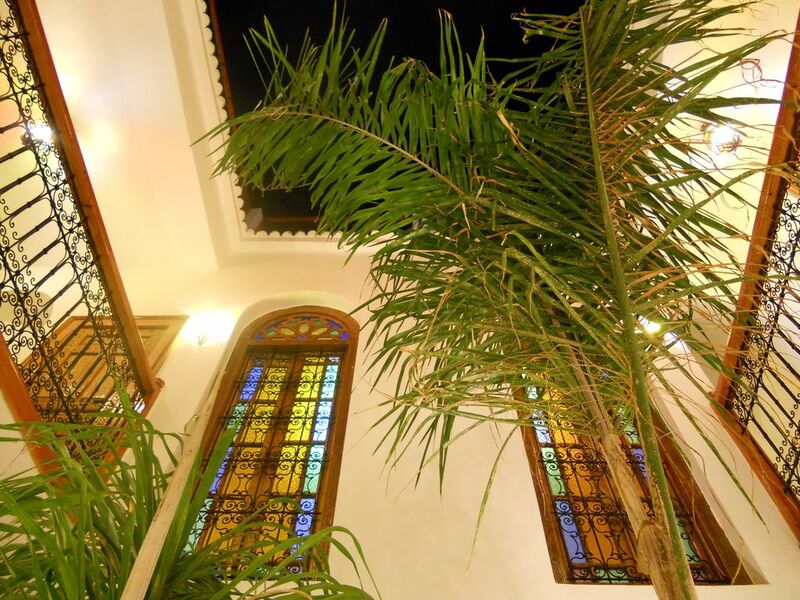 The Riad Dar Yasmina is beautiful and well suited for vacationers. It was well equipped and came with a genie called Amina. She is a real fixer upper and so are the neighbours. Good, friendly community in spite of poverty. The house was very cold on cold winter days and the television was full of programmes in German, French and Spanish, but no English except for news channels. Kristin was a very nice Guest! Welcome back again. Très beau riad, une promesse de vacances dépaysantes et réussies loin des circuits ultra touristiques. A El Jadida on touche au cœur du Maroc simple et populaire. Les lieux sont superbes et décorés avec goût dans le style marocain traditionnel. Accueil chaleureux d'Amina. Au cœur de la cité portugaise, mais à l'écart de la rue principale, cachée au fond d'un dédale de ruelles, cette location offre calme et confort. Dans la ville même, à deux pas, souk permanent pour ceux qui aiment cuisiner eux-mêmes des produits ultra frais, ou bien restaurants de poissons frais grillés. Séjour inoubliable. Je recommande ! Un havre de paix.... décoré avec goût, très bien équipé. Il fait bon y passer du temps ! Propriétaires accueillants et réactifs en amont de notre arrivée. Le point évoqué (stationnement ponctuel d'une charrette à main devant le domicile des voisins, en amont de la rue) rétrécit parfois un peu le passage, mais ne bloque en aucun cas la rue et n'entrave pas la circulation des personnes! Comme évoqué par notre locataire, cela participe au charme "authentique" du Maroc!